“The position of the Shadow Cabinet is to give support to the AFC…we have resolved to support it and we have to discuss it further with our own partners who have not yet been informed of our decision,” Opposition Leader, David Granger told Demerara Waves Online News shortly after wrapping up a Shadow Cabinet meeting. The Constitution states that on the House's approval of a no-confidence motion, the President and Cabinet have to resign and make way for general and regional elections within three months. If the motion is passed before the House goes into recess on August 10, the elections would have to be called by November. However, if it is approved at the first sitting in October, the polls would have to be called the latest by January, 2015. The Guyana Elections Commission (GECOM) has already begun preparing a Voters List which would be valid until January 31, 2015. The PPPC and government have questioned the motive behind the electoral management body preparing the voters roll in the absence of an announcement by the President. The AFC has already formally informed President Donald Ramotar that it would be going ahead with the no-confidence motion because of the alleged unauthorized spending of billions of dollars from the Consolidated Fund on projects and programmes that have been already disapproved by the opposition-controlled House during consideration of the 2014 estimates of expenditures. Pending in the House is the approval of a Statement of Excesses for GUY$4.5 billion dollars that have been already spent so far. Now that Granger's parliamentary coalition has agreed to support the motion, which was submitted by the AFC on August 1, he said the next step would be internal consultations among APNU’s partners and another round of talks with the AFC to fine-tune the text of the motion. “We will have to work out with the AFC the full text. What we have is enough but we need to maybe flesh it out a little bit more but the whole idea is that in principle we have agreed to support the AFC," he said. The AFC hopes that the combined opposition could call a private members sitting of the House to debate and approve the motion before the 65-seat House goes into a two-month recess on August 10. 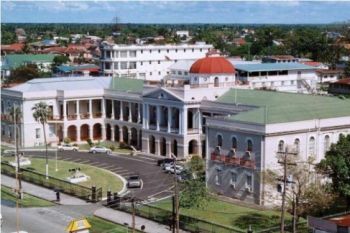 With the APNU deciding to add its 26 seats to the AFC’s seven, the motion is expected to be approved and so leave the governing People’s Progressive Party Civic (PPPC) out in the cold with its 32 seats. President Ramotar has repeatedly said that he is not afraid of going to back to the polls earlier than the constitutional deadline of 2016 to seek a fresh mandate from the electorate. Passage of the no-confidence motion would trigger the resignation of the President and his Cabinet and a return to the polls. The Opposition Leader dismissed suggestions that APNU had attached conditions such as a pre-electoral alliance before deciding to lend its support to the motion. Granger said APNU did not believe that an AFC complaint to the police against Finance Minister Dr. Ashni Singh for his alleged breach of the law and constitution in relation to using money from the Consolidated Fund in the way that he has done would be dealt with speedily by investigators. House Speaker, Raphael Trotman has already ruled that Singh should be sent to the Privileges Committee, a move that has seen government contemplating taking his decision to court because the issue is a legal and constitutional one rather than procedural. Government has insisted that its spending of money and seeking the House’s approval for a Statement of Excess was not unprecedented and was in keeping with the Guyana Constitution and the Fiscal Management and Accountability Act.